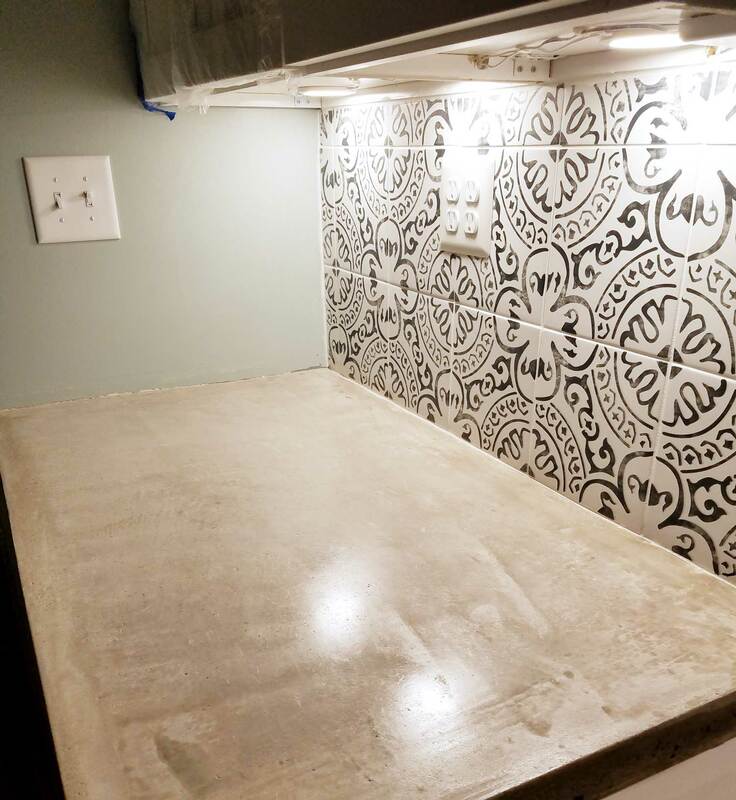 Concrete countertops aren’t for everyone but if you love their unique look you have to decide on whether you want to hire a contractor to form them or do them yourself. 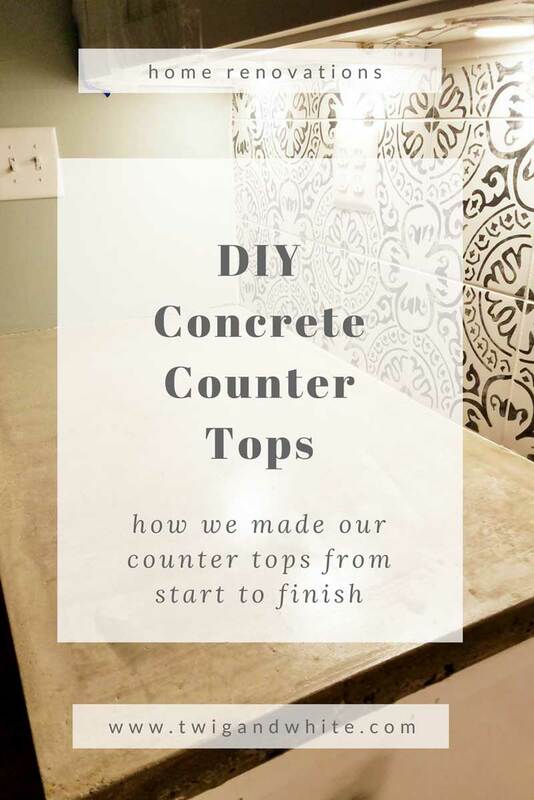 While I wouldn’t recommend attempting DIYing your concrete countertops without at least knowing a little bit about concrete, if you are willing to put in the effort, they can be not only beautiful but extremely affordable. After looking at several counter top materials, B and I decided pretty quickly that we wanted to do concrete again. 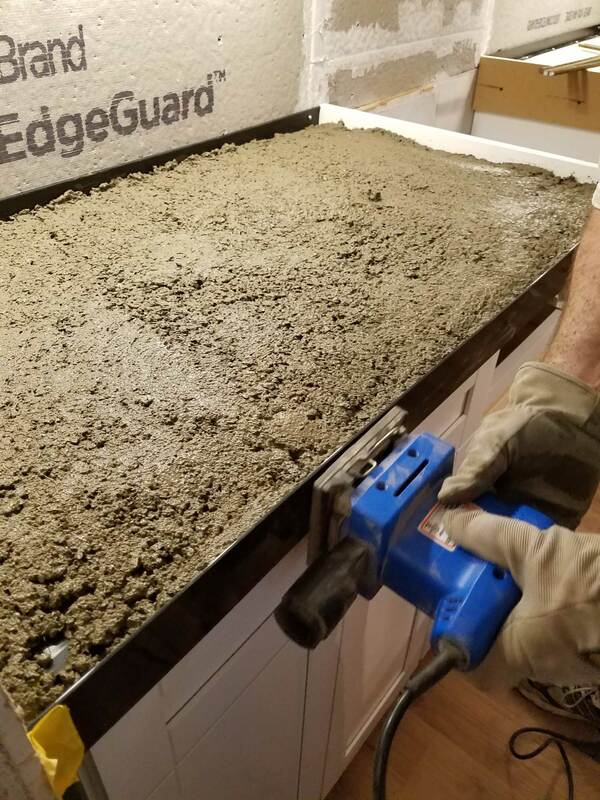 Our first experience with concrete counter tops was in our Philadelphia house. Since then we have done concrete in our first floor powder room and a feather coat concrete finish in my studio. In our previous kitchen we built our forms outside and poured the concrete, let it cure and then moved the counters into place. They are extremely heavy and not how we wanted to do them this time around. 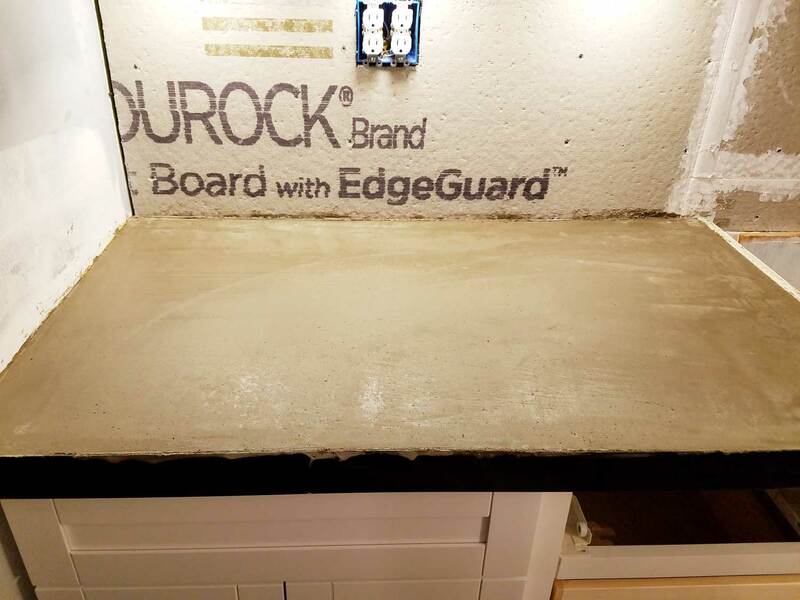 That was 15 years ago and since then, there are many more products on the market that make doing concrete countertops much easier. For our kitchen this time, we decided to pour them in place. We started by building the forms. After measuring our cabinets we ordered these form kits and installed them following their directions. 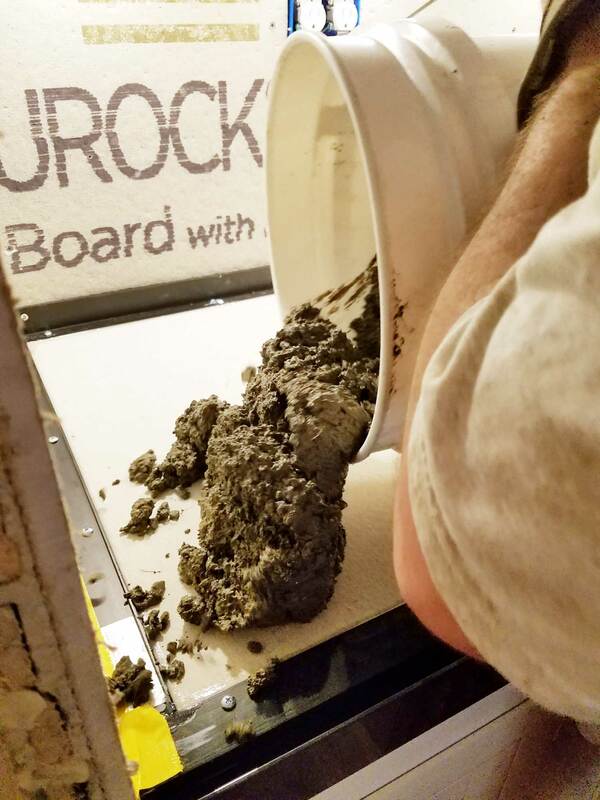 B used clearsilicone around all the edges and in the corners to help ensure the concrete wouldn’t seep through before it set. Once the forms were in place and the silicone set, it’s time for the concrete. 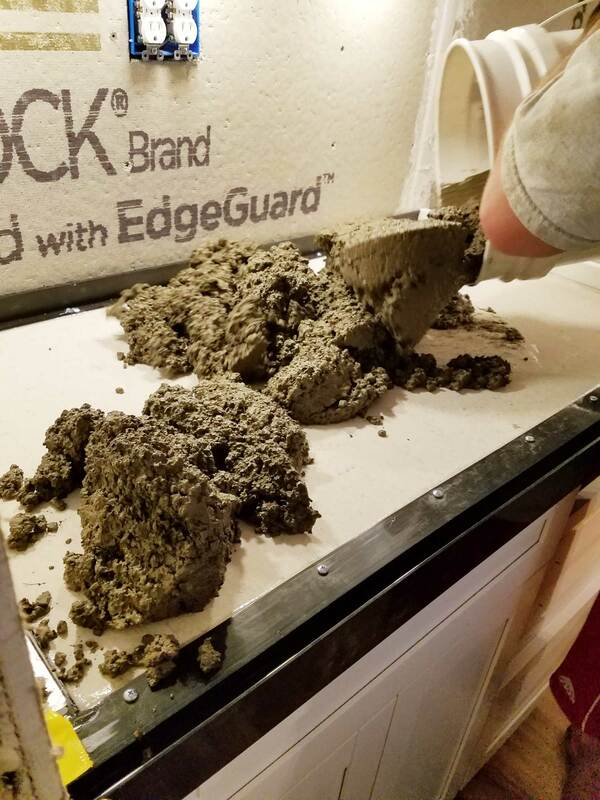 While there is concrete mix available specifically for countertops, the reviews were questionable so we opted for this instead. There are small stones and fibers in this mix that helps make it stronger. We also used rebar to strengthen the concrete further. I suggest mixing the concrete with enough water to make it easy to spread but I warn you to not mix it too wet. We like the look of natural concrete but there are plenty of options out there for tinting the concrete or adding in other materials to customize your look. 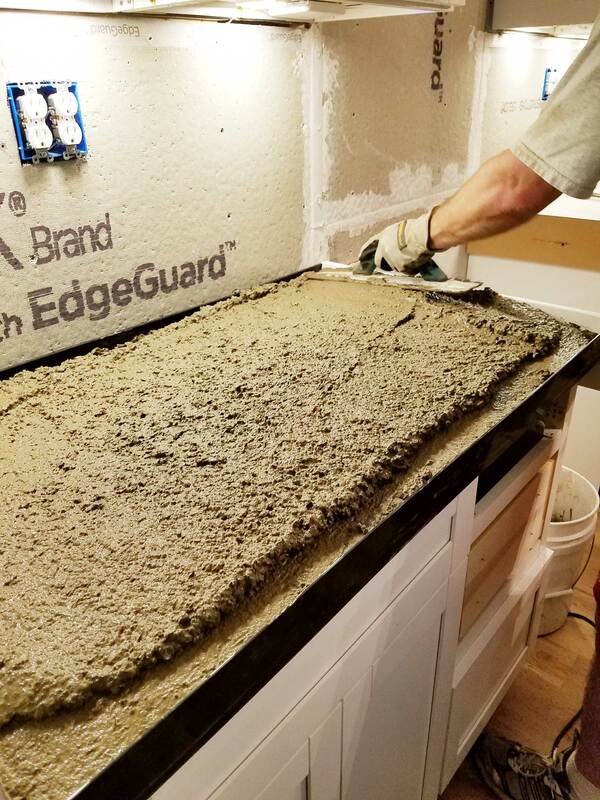 With all the “new” in our kitchen, we wanted the more natural, rougher look of the concrete to balance all the clean. 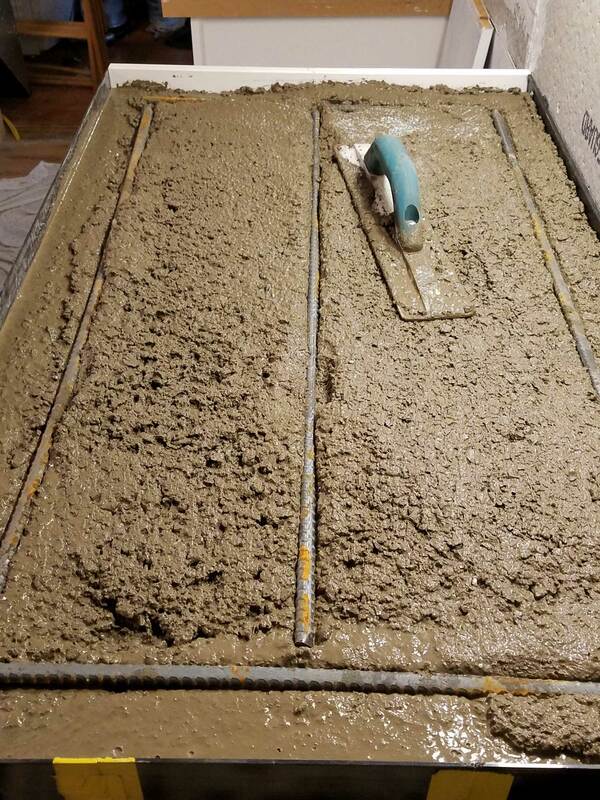 Concrete begins to set pretty quickly so once it’s mixed, you need to keep things moving quickly. B and I worked together. As he carried in more loads of concrete I worked the trowel to make sure it was spread evenly throughout the form. Once the form was full, B worked on spreading it and smoothing it and I went around the edges with a sander to vibrate the concrete and remove all the air bubbles. THis actually worked quite well. We also scraped the top using a 2 x 4 to make it level and remove any excess concrete that overflowed. This is a pretty messy step so be sure to protect your floors! Once we were satisfied with the surface, the concrete was left to set. Periodically B would go over the surface with the trowel to smooth out any rough spots or remove any bumps. 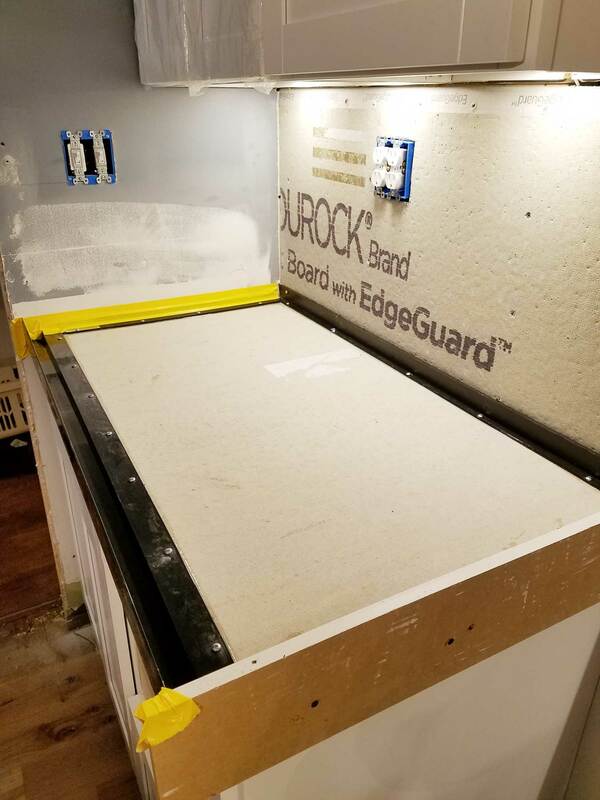 This is also the step that creates the subtle color variations you will see in the finished countertops. 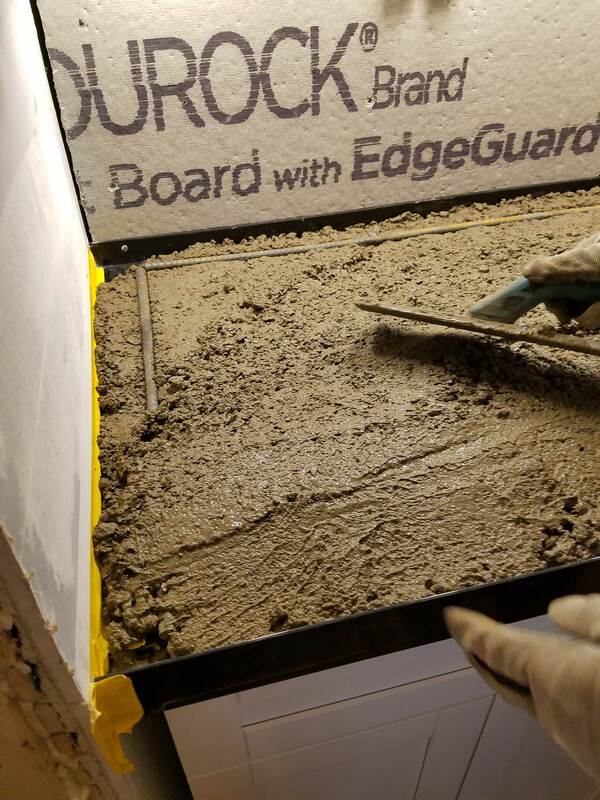 After the concrete has been left to set at least 24 hours, we removed the plastic forms and B sanded the surface and edges to smooth out any slight imperfections. This is a very dusty process to be sure to protect or close off any rooms you don’t want to get dust and wear a mask and eye protection. Concrete can take up to 30 days to fully cure and because it is very porous, it will easily stain. 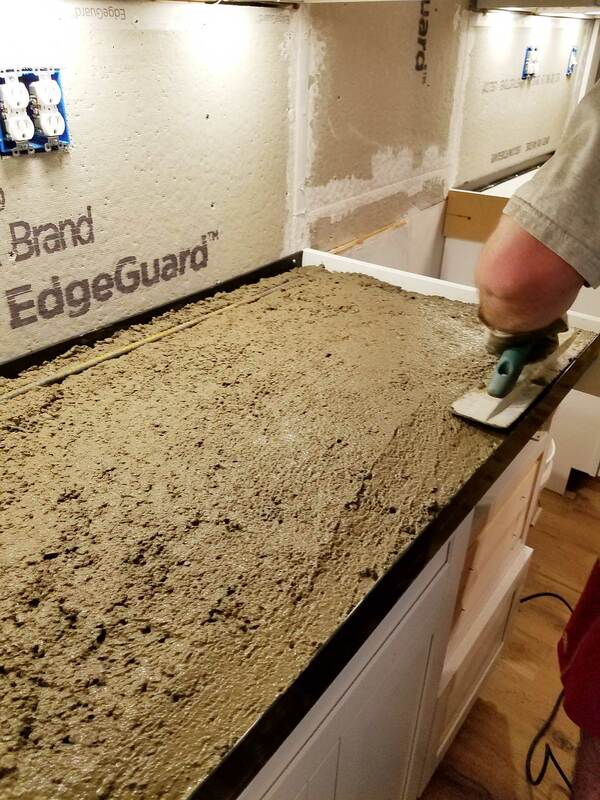 Do not use the countertops until after the concrete has cured and you are able to seal it. 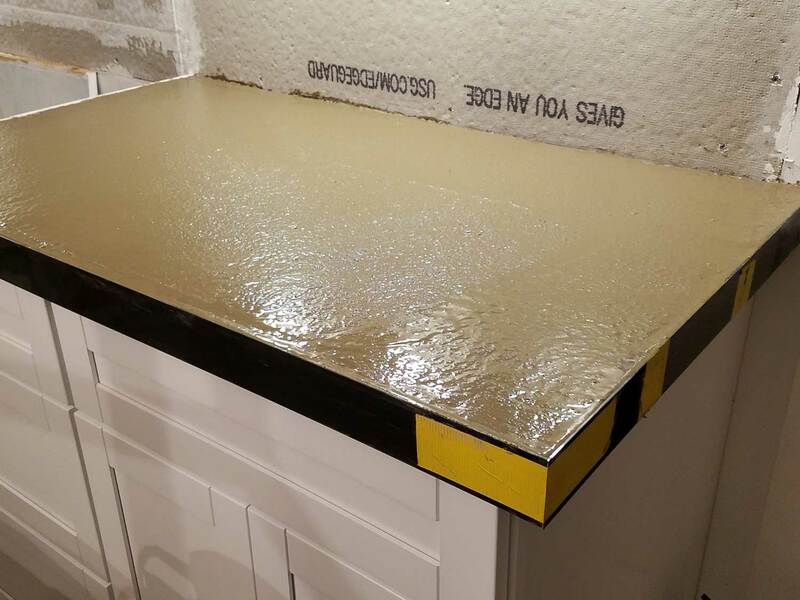 We allowed our countertops to cure for a full month before sealing. When it came time to seal, I went with the same product we used before. I noticed this product received mixed reviews but having used this before and in our bathroom, I will say that if you take your time and follow the directions carefully, it will work well. This product has been around for quite some time and is food safe for use in a kitchen. I actually did the sealing all by myself and it’s quite easy to do and takes relatively little time. I most recently sealed our island and it look less than an hour from start to finish. Once the concrete is sealed, we wait another 72 hours and then buff with the wax. This dulls the shine from the sealer just a bit and adds a little extra protection. The wax process can be redone about every 6 months or so to keep your concrete looking beautiful for many years to come. The finished counter tops are exactly the right look for our kitchen. They help balance all the “new” and make the kitchen feel more like a part of our older home and not just a brand new reno project. They add a more natural, almost raw look to all the polished finishes that makes it feel more casual and lived in. Marble or granite would have been beautiful but concrete is the perfect option for our style. 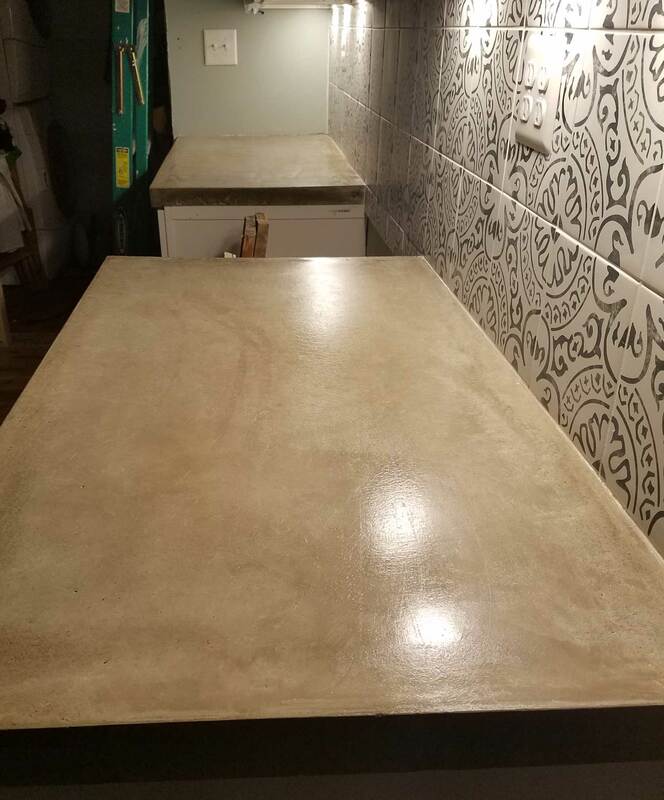 While I will say our countertops have been the most labor intensive part of the entire kitchen project, the time spent was well worth it and we have beautiful countertops that cost about the same as our kitchen faucet!